This recipe was created by the lovely Sarah from Sarah’s Vegan Guide. Check out her blog for more healthy, delicious plant-based recipes! “Streuselkuchen” (also known as crumb cake) is a German speciality. I can’t imagine a family gathering without at least one Streuselkuchen. My grandma’s is the best! Traditionally it is made with a lot of sugar and butter – not very healthy and not vegan at all. Since I had to make some changes to the recipe anyway (to make it vegan), I decided I’d also try and make it as healthy and as natural as possible. 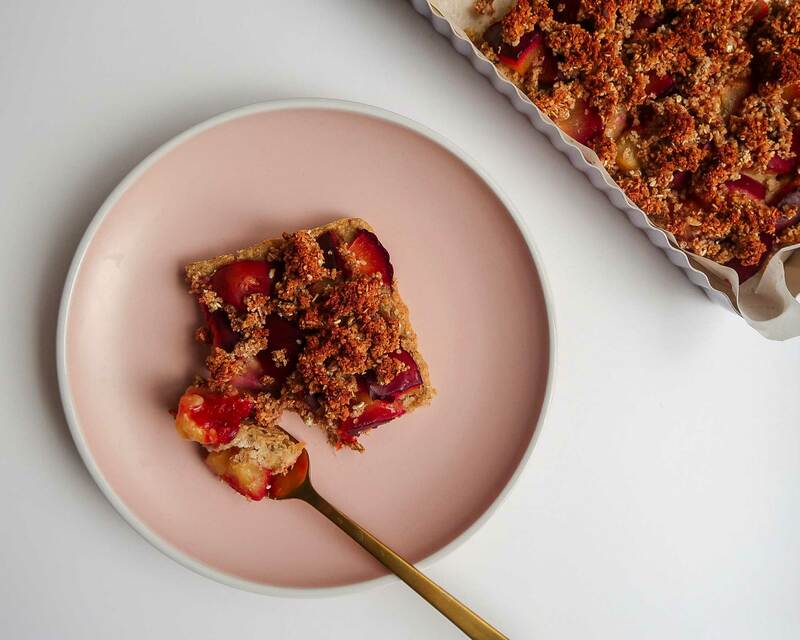 So here you have a vegan, oil-free and refined sugar free recipe for German plum streusel cake! Streuselkuchen is typically a flat cake that you bake on a baking tray. Traditionally, it is made up of three layers. First, of course, you have a base. I decided to go for a simple cake batter although you can totally do a yeast dough, too! On top, you have the delicious streusel (crumbs) that give the cake its name. Instead of sugar, butter and flour I decided to go with oat flour, almond flour and some agave syrup. Of course, you can also use maple syrup or any other sticky sweetener. 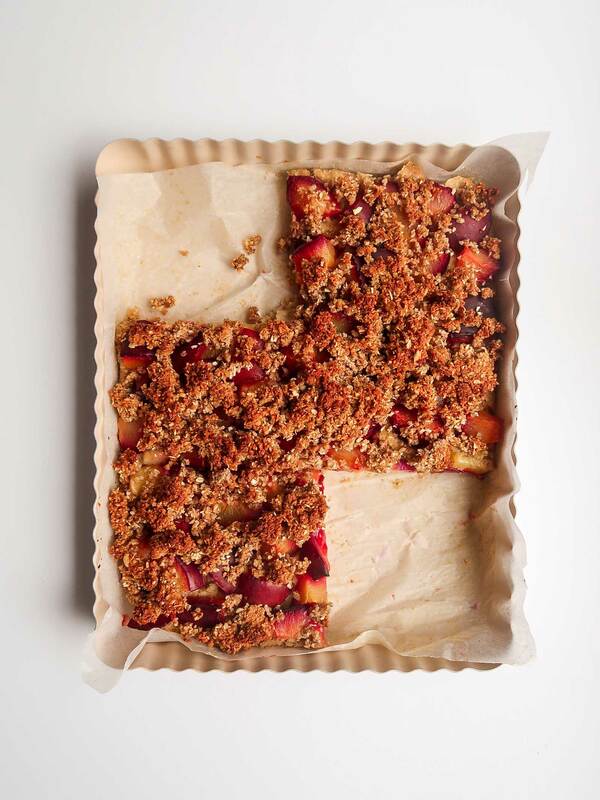 In between the base and the streusel usually comes a layer of fruit – plums, apples, sour cherries, rhubarb. Sometimes it is also made with poppy seeds in between or a layer of pudding. You see, there are a lot of options – so feel free to customise this recipe however you like! 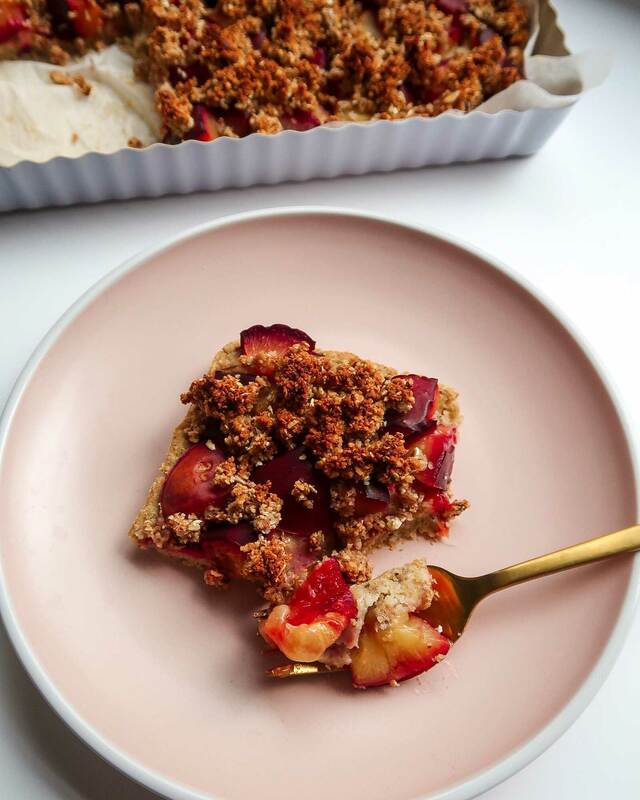 This vegan plum streusel cake is free of refined sugar, oil and also the recipe is without wheat flour. Instead, we are using a combination of almond and oat flour. If you have never made almond or oat flour before, you can simply blend some almonds or oats in a blender until very fine. I usually do about a minute of blending. The batter is sweetened with apple sauce. I’m quite sensitive to sugary things so the apple sauce was sweet enough for me. But feel free to add some agave or maple syrup if you want it a little sweeter. Keep in mind the plums also add a lot of sweetness. The apple sauce not only makes the batter sweet, it also adds some moisture which is important since we are not using oil. I also decided to add some cinnamon to the streusel for a wintery touch. You can totally omit that if you’re making this in spring or summer. How about adding some cocoa powder instead? Find Sarah on Instagram, Pinterest and Facebook for more vegan goodness! This vegan plum streusel cake is a German speciality with three delicious layers. It's crumbly, fruity, sweet and tart. Preheat your oven to 160°C/320°F/Gas 3 and line a 18x24cm baking tray. Prepare the chia egg by adding the chia seeds and water to a small bowl and mixing well. Let sit for a couple of minutes so the chia seeds soak up all the liquid. In a bigger bowl, mix together the plant-based milk, apple sauce, lemon juice and vanilla. Add the chia egg. Add in the oat flour and baking powder, and stir to combine. Pour the base mixture into the baking tray and place in the oven for 10 minutes. In the meantime, pit the plums and cut them into little pieces. Prepare the streusel by adding the oat flour, almond flour, cinnamon and agave syrup and mixing well. You might want to use your hands here. Remove the baking tray from the oven and spread the plum evenly onto the base. Top with the streusel and bake for another ~35 minutes until the top is golden brown. Let cool for ~15 minutes before cutting and serving. You can store in the fridge for a couple of days.